I am back from the Highlands and managed to stop by Loch Ness on two occasions. Apart from a general family holiday in the region, from a cryptozoological point of view, four objectives were achieved. First was to visit the Nessie exhibition at Inverness, second was to talk to the Hargreaves who had a recent sighting at Foyers and thirdly to visit the area of the Hugh Gray photo/sighting. I will address these in later posts but the fourth and perhaps most important aspect of the visit for me was the use of trail cameras at Loch Ness. Now I doubt I am the first to use these consumer devices at Loch Ness, but in terms of my own personal longer term Nessie hunt, they may prove a valuable tool. Trail cameras (or game cameras, trail cams, scouting cameras, hunting cameras) have been around for years and are primarily used by hunters, gamekeepers and estate managers to keep track of deer, vermin and other creatures. The reason they are so useful is that they are totally automated and can be mounted, primed and left to scan the area without any human presence which would deter wary animals. 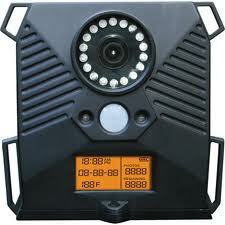 The devices work using motion detection hardware which triggers the camera to take one or more pictures. The device may also have infrared capability which allows night time pictures to be taken (which makes sense since animals tend to be more active at night). These devices have been popular with Bigfoot hunters and are regularly featured on such shows as MonsterQuest. But for me, it was trail cameras hunting Nessie and therefore I headed north a couple of weeks back to install the camera shoreside. The plan was to place the camera in a prime spot, drive on for the rest of the holiday and return 10 days later to collect it. There are certain parameters that have to be considered in this plan. First is the type of camera. There is an obvious risk in leaving a trail camera in a public place - it could be stolen. So three things have to be considered - location, camera and fixing. In terms of location, I spend some days looking over Google Streetview to decide on a piece of shoreline which was not visited much but offered a hiding place for the camera yet also an uninterrupted view of the loch. A spot between Foyers and Dores on the quieter southern road was selected which fulfilled these requirements. Second was the type of camera. I wanted a camera that offered decent motion detection, pixel quality, SD card memory, battery life and night time IR photography but at the same time would not be a hit on finances if stolen. This meant a compromise between risk and reward and I went for the Wildgame Innovations IR2 2mp model which I got off eBay for $50 (£30) and free shipping (if you live in the USA!). Now the best trail cameras will cost more than ten times this but I was not prepared to leave such an expensive camera for 10 days (I do have a better model but that will be for another day). The spec of the IR2 is stated as 2 megapixel camera, IR LED flash out to 25 feet, motion detect out to 40 feet, up to 2Gb SD card picture storage, 4 C-type batteries for long life and 1 minute delay between image captures. Clearly it has its limitations. Anything beyond 40 feet by day or 25 feet by night will not register but that is the price of not having to sit on the shore yourself all day. But on the other hand, a close up shot from 40 feet would go a lot further in solving the mystery than a blob at 200 yards! In terms of fixing and securing the camera, here is the in situ photograph. I painted the originally black camera a fetching garden green to blend in better with its environment! I merely strapped the camera to the tree with bungee cords and made sure the camera was primed and aligned with the loch surface (this would usually involve taking a test picture and checking the SD card on a normal camera). So I drove off and returned ten days later wondering what may have transpired. I was first of all pleased that the camera was still there and had not been nicked! I waved my hand in front of the camera and it dutifully snapped a shot to prove it was alive and kicking and had survived whatever rigours it had been subjected to. In all, it had taken eighteen pictures while I was away and I must say I was impressed with the camera's performance. On the first picture I was immediately rewarded with a picture of a long necked creature. However, it was of the avian type as the picture below shows. The camera usefully added a timestamp to the picture as well as the temperature in Fahrenheit. The bird can be seen flapping its wings to the left and demonstrated that the camera could work in the dark (though since this was more twilight, I don't think the camera triggered its IR flash). Five more pictures were triggered by strong sunlight and show only a calm loch. Three pictures show nothing and may have been triggered by the branch moving above or a bird flying quickly past. One shows the IR capability and was triggered at 2:43 AM (see below). What triggered this is not known as it is pitch black beyond the rock and branch (possibly the branch again though I would have expected a branch to trigger more often in that case). Six pictures captured people passing by in their boats as one example further below shows. The final picture (chronologically) is the most interesting and is shown below. Is it Nessie swimming past or just a log being washed ashore? I would suspect it was a long branch being washed ashore in the wake from a large ship which was mid loch and hence out of range of the motion detection. By the time the log hit the shore, the boat had moved beyond the left of the camera field of view. It is a big branch though, I estimate over six feet long. I also would have expected to have seen more turbulence on the loch surface and some propeller wash. However, it doesn't look very Nessie like either so I won't push this one! This is where a superior rapid fire model would have helped as the motion of the object could have been tracked in successive pictures to aid its identification. What did surprise me was how the level of the loch surface changed over a short period of time. Compare these two pictures. In the space of less that two days the rocks visible in the first picture have completely submerged in the second. It looks like the loch surface level had dropped and risen by a good couple of feet! I can only infer this is due to inundation of water from streams due to heavy rainfall. So no Nessie but a successful trial run of the camera. I hope to be back up in the months ahead to run the camera again and continue to hold out for that conclusive picture!